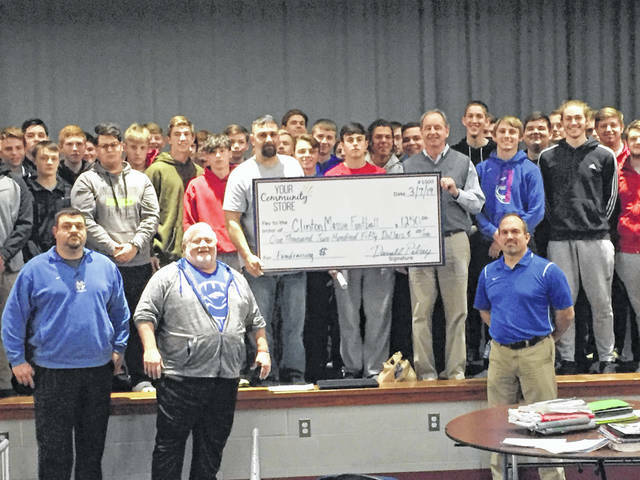 Clinton-Massie football coaches Jeskee Zantene (front left), Dan McSurley (front left) and Scott Rolf (front right) and the football program received a check from We Help Others, the parent company of Your Community Store. Holding the check are Darrell Petry, left, of We Help Others and Al Bell, right, of the Caesar Creek Flea Market. Though Clinton-Massie’s football team is the first school organization to take advantage of this Your Community fundraising, Darrell Petry said this ideal is open to any group. Petry said any organization can take part in the Your Community Store process. For instance, Petry said, Girl Scouts can pick up items when they drop off their cookies. ”In this situation, cookies will be dropped off, stuff will be collected, more money will be earned, a life is decluttered and success of school fundraising is increased,” Petry said. Some would equate the process to a rummage sale and Petry agrees but says the Your Community Store takes things a step or two further. In addition to the storefront at the flea market, Petry said sales are made on Facebook, eBay, EBTH, and other online platforms. Petry can be contacted via email at: darrell@wehelpothers.com. Darrell Petry is a 1998 graduate of Clinton-Massie High School. Petry, along with 1995 CM graduate Mark Hackney, co-founded We Help Others and Your Community Store. Petry is the lead treasure hunter. Items also can be delivered to Caesar Creek Flea Market on Saturdays or Sundays from 9 a.m. to 5 p.m. Ask for assistance in Aisle 2, Petry said. McSurley said anyone interested in having items picked up can call him (937-728-5407). Also anyone interested in donating items can call 513-433-3550 or email Petry at the following: darrell@wehelpothers.com.